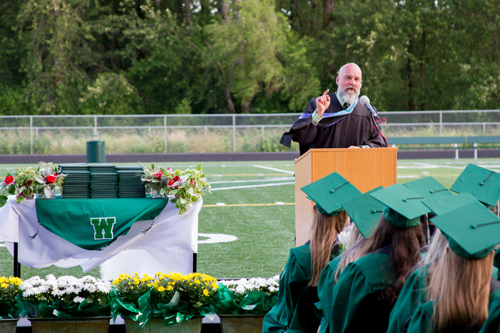 Woodland High School celebrated its largest graduating class with 155 graduates in a series of events culminating in the Commencement Ceremony on Friday, June 15. Graduates took part in a Senior Breakfast, paraded through district schools in the Parade of Graduates, and concluded by walking in the 110th Annual Commencement to receive their diplomas. On Friday morning, graduates gathered at the Woodland Presbyterian Church for a special breakfast provided by volunteers and the church pastor. 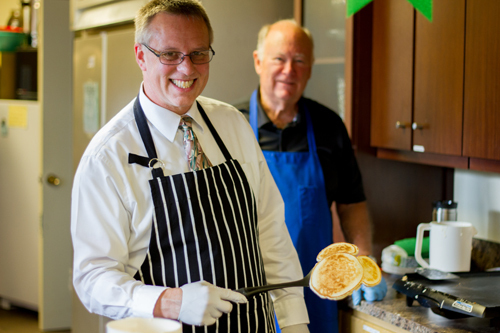 The Presbyterian Church has celebrated the success of graduating seniors by graciously providing a special breakfast as a Woodland tradition for nearly 70 years. 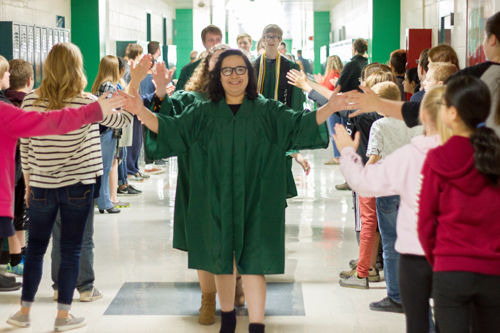 Following breakfast, the graduates donned their graduation gowns for the third annual Woodland Parade of Graduates. Graduates parade through Woodland Primary School, Woodland Intermediate School, Woodland Middle School, and even Woodland High School. Students prepared banners and posters celebrating their older counterparts' graduation and lined the parades route to cheer. Some students give high-fives to graduates as they passed. The Parade of Graduates was developed and organized as a joint project by the district's entire administrative team. "The parade serves to inspire students in younger grades to see the end goal of their years of learning," said Dan Uhlenkott, Assistant Principal of Woodland High School. "Both the graduates and the younger students were so excited to take part in the celebration." While riding the buses between campuses, grads reflected on their time attending the different schools by regaling in memories of their favorite teachers lunches, recesses, fire drills and other events from their academic careers. 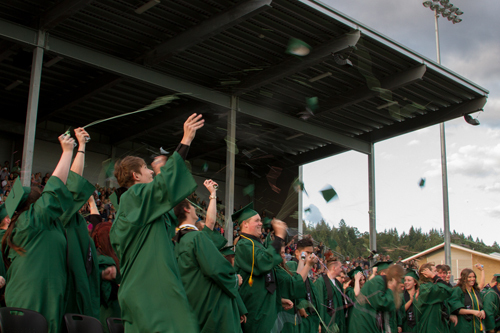 The Class of 2018 broke the district record for largest graduating class as a total of 155 students graduated. 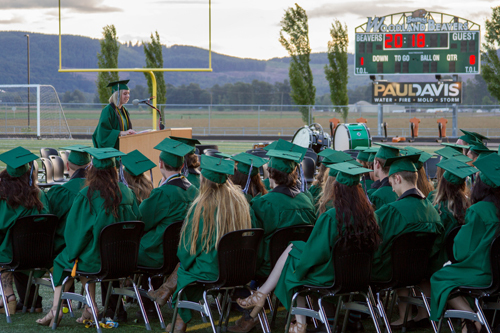 Woodland High School's 110th Commencement Ceremony on the evening of Friday, June 15, and was the first commencement ceremony held at the new high school’s stadium, first opened in August 2015. The Woodland High School band played "Pomp and Circumstance" as the graduates entered followed by the WHS Jazz Choir singing the National Anthem. 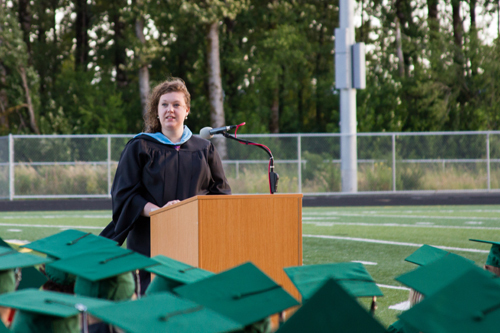 Natalie Biddix, Senior Class Speaker, served as the Master of Ceremonies, opening the commencement with a speech reminiscing about her classmates’ time attending Woodland Public Schools. Natalie also spoke of the challenges facing her classmates throughout the years including learning to navigate an entirely new high school. Cooper Kaml, the first of two class speakers selected from tryouts, spoke of recognizing experience as the result of not getting what you planned. Cooper also emphasized the importance for his classmates to defy the expectations set forth for their generation, striving to do good work and achieve the best they can throughout their lives. Following his speech, Green officially certified the graduating members of the Class of 2018 had met the requirements and presented the class to Board Director Lesa Beuscher who handed out diplomas to each graduate.